24 February 2017 : my Oxford lecture was noted in the RCS News. Click here. I may have mentioned that I was recently elected Honorary Librarian of the Friends of Wighton in Dundee. I like to think Andrew Wighton – who featured in my thesis and subsequent book – would have approved. He would also have approved of the first Cappuccino Concert of the season in Dundee Central Library on Saturday 20th August, featuring songs from Alexander Campbell’s Albyn’s Anthology. Campbell was the subject of my third chapter: ‘To take down a melody’: travel in pursuit of song. (pp.71-103) As it happens, I was overjoyed to meet one of his descendants in Norwich a couple of weeks ago- and I am equally excited that some of Alexander Campbell’s songs will feature in the forthcoming concert. Friends of Wighton‘s autumn season kicks off with a series of great concerts featuring some of the finest singers, in both Scots and Gaelic traditions, in Scotland. Double Mod Gold Medallist Wilma Kennedy, one of Scotland’s finest Gaelic singers – and, we are proud to say, Wighton Gaelic song tutor – with a programme which includes songs from Albyn’s Anthology, which is in the Wighton Collection. The First Edinburgh Musical Festival: ‘Serious and magnificent entertainment’, or ‘A combination of harmonious and discordant notes’? NB Brio is the official journal of IAML (UK & Irl). 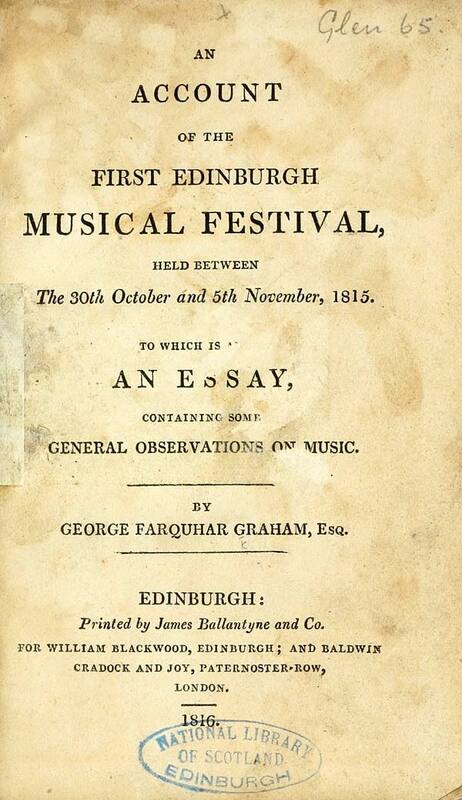 Edinburgh’s First Musical Festival took place in 1815. The Edinburgh Festival has certainly not run continuously since then! Indeed, there was a whole century in which there was no festival. July 2015. The Bass Culture in Scottish Musical Traditions project is hurtling towards culmination – everything has to be completed by mid-October. 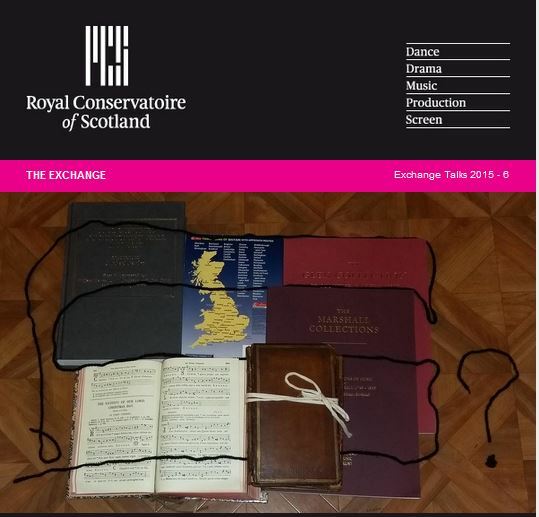 While I continue in my role as music bibliographer, providing the documentation for the ultimate (but not yet visible) HMS.Scot web-resource, David and his merry band have been making recordings and playing for historically-informed dance sessions. In addition to the Bass Culture blog, there’s now another – the Nathaniel Gow Dance Band blog. I must admit that, compared to the vibrant and dynamic activity of performers and dancers, I feel rather staid and boring! However, each to his last – and in my case, I’m neither a dancer nor a dance-band musician. (Sometimes the truth hurts!) Just think of me when you’re reading the details about our hundreds of sources, where to find them, and who their compilers and publishers were. Commentary on the paratext (anything in the book that is NOT the musical text) is often mine, too. When the project ends, I have funding for a smaller project of my own, into the copyright music collections in the Special Collections of St Andrews University Library. I’m looking forward to getting my teeth into this intriguing collection, and I’ll be starting another page on this blog – or even a new blog altogether – to document what I find. I’m hopeful this might be the start of something rather big and beautiful. April 2015. I decided to make the best of my Bass Culture blog contributions more easily retrievable. So here they are! When I share my subject knowledge, I want to meet my listeners “where they’re at”, and take them to new and inspiring places. I aspire to have an audience hanging on my every word – but that is a work in progress! Trying to compare our conception of traditional Scottish music today, with what was considered traditional and Scottish in the past, is rather like going back to your ancestral home, and realising that the road layout today bears no resemblance to the historic map that you painstakingly downloaded. Music educationalists go to great lengths to ensure that students understand what ‘Scottish music’ was like at various stages in the past – whether the folk revival of the sixties and seventies, the Celtic Twilight, or indeed, any point when particular published song or tune collections can be identified as a watershed of some kind. And yet changing musical styles and the influence of popular music trends mean that the music we identify as traditional Scottish music today bears little resemblance to those early collections. Indeed, our individual take on what is truly Scottish varies almost as much across the current musical spectrum, as with those different points in the past. 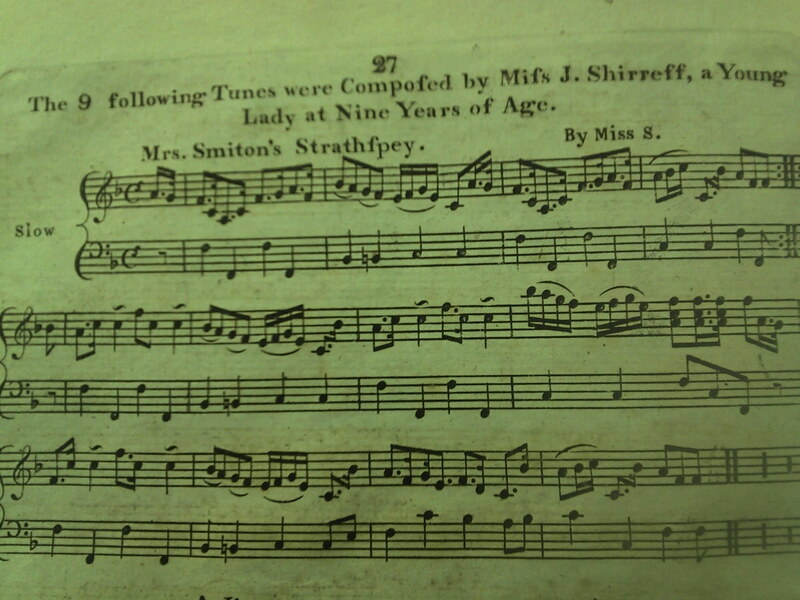 After a seminar on nineteenth century songbooks, how much use will be made of those books by today’s undergraduates? English collectors from the late eighteenth to late nineteenth centuries got into hot water by arguing about what was actually Scottish music. Theirs were arguments about authenticity and origins, for different sources appeared to tell different stories. I’ve come across three very similar tunes that have been claimed by their collectors at different times as Highland and Northumberland pipe tunes or Lowland song. In 1891, John Muir Wood conceded that it was easiest to accept that some tunes were merely Scottish by repute. How much further have we come in 123 years? Throw out the pipes and fiddles, and we risk throwing the baby out with the bath water – but insisting on a Scottish pedigree is also problematic. How do we feel about acknowledging music that is Scottish only in feel and not in origin? 2014-07-20. DANGER! CREATIVITY AT WORK! 2014-03-02. INSIDE THE STUDENT MIND? 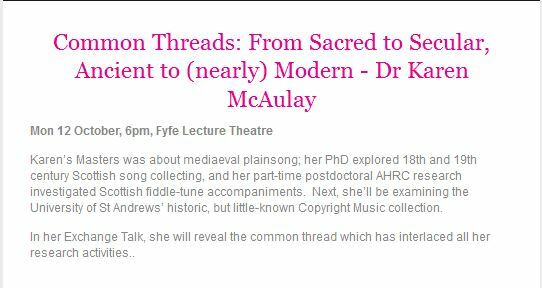 I’ve been reworking a lecture/seminar on historic Scottish song collections, for later on this week. This’ll be the fourth time I’ve delivered this session. I’m trying to reflect on what worked, and didn’t work, last year. Suddenly it came to me that I needed to consider what the students wanted out of the session, as well as all the fascinating information that I want to put into it! I’ve been tweeting a few trad musicians that I know, picking their brains about how they choose performing repertoire. Armed with this info, I put together a blogpost which I hope might get me some more useful insights! Whittaker Live is the performing arts blog that I’ve authored for 14 or so years. It seemed a good place to ask these questions. You can read my Whittaker Live blogpost here.